Always arrive in plenty time to make your tee time, if playing away you should plan to be at the venue one hour before your tee off time, this will give you time to familiarise yourself with the layout have a relaxed check in, hit some shots then a few putts, and if necessary a final visit to the loo or time to have a cup of tea then check your clubs make sure you can identify your ball and take a relaxed stroll to the first tee to meet your playing partners or opponents. Always be fresh when you go to practice because while practice makes perfect, perfect practice makes even better. It is important to have a set agenda or planned routine as your time is precious and you resources limited. Plan you sessions to cover all your clubs but ensure you warm up correctly and finish properly, it is beneficial to have a priority of rhythm and tempo both when beginning and ending the sessions. The middle of your sessions should be concentrated on whatever mechanical adjustment you have been coached on or perhaps just general shot making with all your clubs. 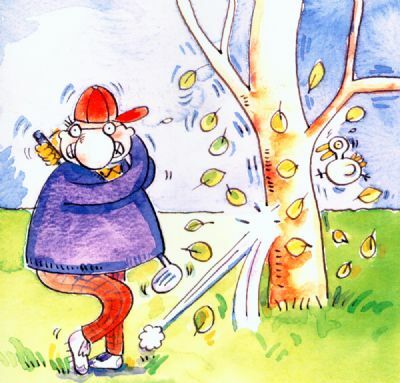 Avoid practicing on really windy days but if you have to go concentrate on your short game. Create a soft steep backswing. Due to the steepness of the backswing the club will move outside the line creating an in to out action therefore aim a little left of target to allow for the cut spin. As part of your short game strategy develop the following rule of thumb tactic whereby you putt when you can, when you can’t putt chip and when you can’t chip pitch. This means you always try to keep the ball close to the ground , this is definitely the easiest option particularly off tight lies and remember a poor putt will often end up better then a poor chip.